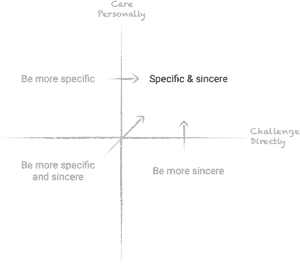 Manipulative Insincerity is the worst of the quadrants in our Radical Candor 2×2 because you don’t Challenge Directly or show you Care Personally. Unfortunately, when you or those around you behave with Manipulative Insincerity, it’s often reciprocated and difficult to break out of. 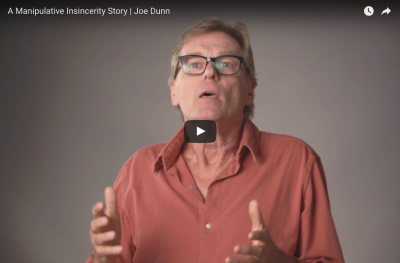 We shared a story from Joe Dunn last year about Obnoxious Aggression. Now here’s a continuation of that story, when Joe found himself in a meeting surrounded by Manipulative Insincerity. Have you experienced something like this? Share your story with us! Remember that the labels that we use for the Radical Candor framework (Radical Candor, Ruinous Empathy, Obnoxious Aggression, Manipulative Insincerity) are not labels for people. They’re ways to describe specific interactions, to help make Radical Candor easier. By sharing stories that show how these types of behaviors come about, we hope to remind you that we all make mistakes and help you learn from ours. Have you found yourself in a similar situation? We’d love to hear your stories! We’ve shared a couple of stories from Russ, telling about a time he was Ruinously Empathetic with his feedback, and then how he shifted to Obnoxious Aggression. What happened next is a common path; his Obnoxious Aggression led to Manipulative Insincerity. You may remember it from Stephanie Usry’s story a couple of weeks ago. It’s easy to see how we could all experience similar situations and fail to Care Personally or Challenge Directly. Can you relate? Remembering stories like this can help spur you to Challenge Directly and show you Care Personally in these types of situations in the future. Share your stories with us, too! Most of us don’t consider ourselves to be jerks or rude people. So if we discover that we’ve been Obnoxiously Aggressive, we’re chagrined! Unfortunately, the natural tendency then is to back off the Direct Challenge. Obnoxious Aggression turns into Manipulative Insincerity. In our latest video, Candor Trainer Stephanie Usry tells her stories about following this journey. Next time you find yourself being Obnoxiously Aggressive, remember this story. Instead of backing off your Direct Challenge, push yourself higher on the Care Personally axis. 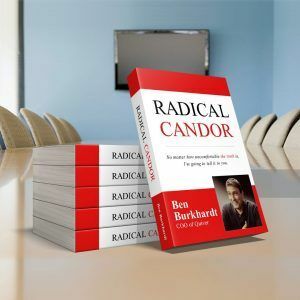 This will help you move in the right direction, towards Radical Candor. We hope that by sharing stories like Stephanie’s we can help you feel less alone in these challenges and help you avoid making these same mistakes. We’d love to hear your stories, too! Reach out in the comments below, or send us a note. 3) At the same time, continuing to encourage current fans to spread the word about our games and tell others to buy them. 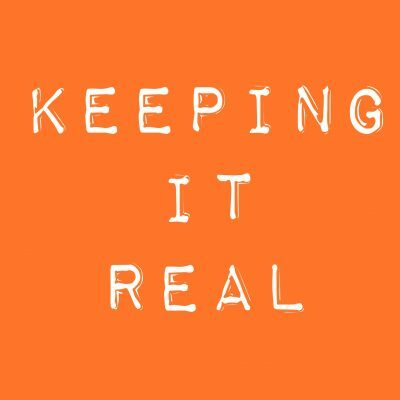 Conventional entrepreneurial wisdom is all about “faking it ’til you make it”, which is really just a euphemism for lying. I’m not talking about outright financial misrepresentations or the like, even though most advice about that is given with a wink and a nudge. It’s more a matter of how you frame things – “selling the dream”. I am determined to make this triple-bottom line company work without sacrificing moral integrity. The challenge is, potential investors & potential team-members (I’m talking to industry veterans who have been “around the block”) actually expect entrepreneurs to lie, exaggerate & gild the lily, so, if you start w the truth, you start w a big disadvantage. How best to deal with that? And, wrt one’s public face, how to keep fans close & the media happy without pretending one is rolling in profits and fighting off Google & Apple at every turn? In his effort to provide a “theory” of BS, Frankfurt distinguishes it from a lie. 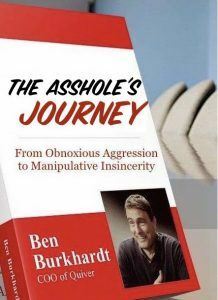 He says the essence of BS is that it is: “unconnected to a concern with the truth.” BS exhibits a kind of mindlessness, a disconnection from reality, that is in many ways even more insidious than a lie. 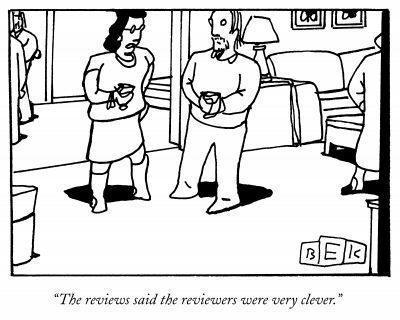 Unfortunately, bloviating BS works especially well in a “hot” market where it’s less likely to get challenged. Bloviating BS is a particular type of Manipulative Insincerity. “BS” is way on the wrong end of the “challenge directly” axis. It’s not a just about hiding what one thinks or even actually lying about what one thinks, it’s totally unconcerned with what the best answer might be. In the worst cases it simply ignores objective reality. 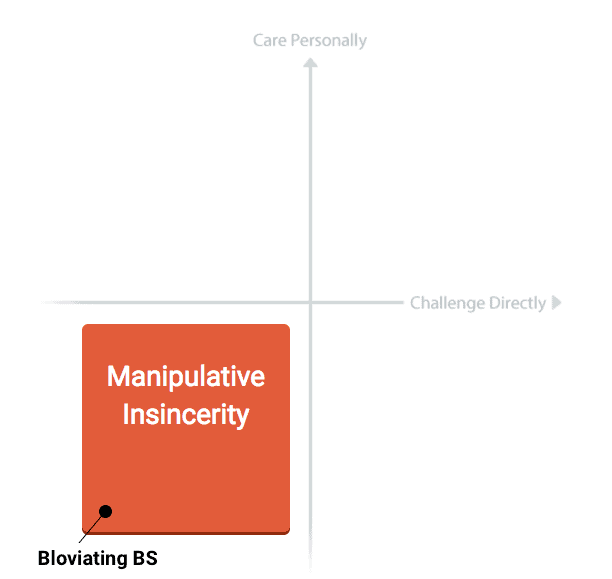 The fact it’s “bloviating” both worsens its value on the “challenge directly” axis and means it’s way on the wrong end of the “care personally” axis. The people spouting it are more focused on making themselves look good rather than caring personally about the person/people they’re talking to. In extreme cases, the bloviator is preying on the emotions of the person/people they’re talking to. Bloviating entrepreneurs, for example, are usually preying on greed and the fear of missing out. At its best, bloviating BS (like all cases of Manipulative Insincerity) is harmless. At its worst, it can be very dangerous. You don’t need bloviating BS. The good news is that Radical Candor works better than bloviating BS in the long run, even though the long run can seem a long time coming sometimes. L.J. Rittenhouse, CEO of Rittenhouse Rankings, is the inventor of Candor Analytics. Her financial linguistic research over the past 15 years shows that companies led by CEOs who ranked highest in Candor, significantly outperformed the market and also those ranked lowest in Candor. Her book Investing Between the Lines (McGraw-Hill 2013) was endorsed by Warren Buffett, and it describes the methodology used to score key words, phrases and concepts and identify positive and negative value indicators. A total Candor score reveals the amount of truth and BS in executive communications. Her research is so solid she’s in discussions to create the first ever Candor Investment Fund. It will find companies with leaders who are more candid, more trustworthy and achieve better overall performance. If you suspect the last ten people have claimed a market is $10 billion and you believe it to be $100 million, say so. Announce your intention to play a different game. 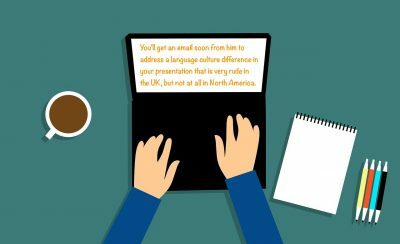 Establish your credibility by sharing information the person you’re speaking to may not know. Use this credibility to focus on facts and a quest for the truth than a big story. Don’t prey on the insecurities and weakness of the people you’re meeting with. Show that you understand what they care about, and prove that you care about it too — if you really do. Appeal to their better instincts, and don’t be afraid to show your own. Hopefully these tips are helpful and inspire you to stick to your instinct for Radical Candor. Readers, if you have additional tips for David, please share them in the comments! Manipulatively Insincere praise is given not because it is genuine, but for another motive or agenda. Here’s a story about how realizing you have been Obnoxiously Aggressive can lead to a worse place, Manipulative Insincerity — a not uncommon path. A couple months after joining Google, Kim had a disagreement with Larry Page about his approach to an AdSense policy and wrote an openly critical and arrogant email (watch the video here). Fear drove Kim to say something she didn’t really believe, in the hopes of gaining approval. Just remember that being under pressure can make anyone act like a jerk. And when one is called out for being a jerk, it’s an all too natural instinct to become less genuine and more political — to move from Obnoxious Aggression to a worse place, Manipulative Insincerity.